…and they had some other games in which they got torched on the ground by good spread concepts like the Baylor O, OSU, and Manziel’s Texas A&M. They also got pushed around some by Notre Dame in a 30-13 defeat. However, much of that was a function of utilizing nickel and dime packages that allowed the Sooners to erase opposing passing attacks with man coverage (they finished 15th in S&P+ thanks to that) and set up Tony Jefferson and Javon Harris to roam free in the middle of the field. They lead the team with 119 and 86 tackles respectively while picking off eight combined passes (with lockdown CB Aaron Colvin adding another four). Anyways this formula was bad for handling teams that could run from 10 personnel sets as it asked too much of the safeties in terms of closing and tackling in space behind a DL that wasn’t terribly athletic. Mike Stoops grievously underutilized Corey Nelson that season. The next few defenses tried to find a better balance, typically by always playing at least one safety that could play man coverage so that they wouldn’t have to turn to dime in order to match up in man against spread sets. They also played considerably more cover 3 and began to play CBs like last year’s hero Tre Norwood, a 5-11, 170 pounder. This is all very different from what Oklahoma’s defense looked like the last time Mike Stoops was in charge. Those who followed my debate over the 2017 Oklahoma defense with Allen Kenney and Rufus Alexander may immediately notice that this defense played extensively out of the nickel sub-package. That was the name of the game at Oklahoma back then and it didn’t go away when superman graduated to the Dallas Cowboys, nor did it depend on his unique skill set. What should stand out very plainly was that this defense was fairly small and REALLY fast. Dvoraceck and Harris weren’t a particularly large pair of tackles but they were in opposing backfields before anyone knew what to do about it, Cody was large for a DE but his counterpart Jackson was not. Gayron Allen was not a particularly large linebacker and while Lehman had prototypical size he also had freakish speed. Derrick Strait was a fourth-year starter at this point and they used him in a fairly unique fashion while he piled up 69 tackles, seven tackles for loss, 12 pass break-ups, three interceptions, and four fumble recoveries. The way they used him kept him much more involved in the every down action than the better 2010s cover 3 CBs at OU like Aaron Colvin, Zach Sanchez, Jordan Thomas, or now Tre Norwood. You can’t play cover 2 against the spread if you’re not in a nickel package. 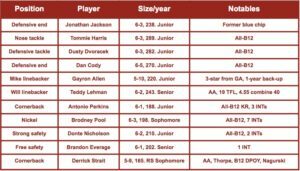 That’s one of the big points of emphasis I hammered last offseason and it’s a glaring difference between these 2003 Sooners and the Sooners of the current, 3-4 era. The reason you can’t play cover 2 against the spread is the problem of trips formations, which force a defense to have their strong side linebacker line up outside of the hash marks. If you want that guy to have help over the top from the safety then you’re very vulnerable up the seam from the slot receiver inside, so most adjustments to this set either require dropping a safety down to play man, rolling the opposite safety over, or playing Tampa-2. In this “stress coverage” you’re basically just playing off zone to the field and hoping that either your field corner and sam linebacker can cover a ton of grass and/or that the opposing QB doesn’t have the arm strength to work the ball outside of the hash mark. Now you can play four over three to the field without asking your LBs to cover a ton of ground laterally, you can challenge the flat throws more easily, and you can still play cover 2 on the backside. 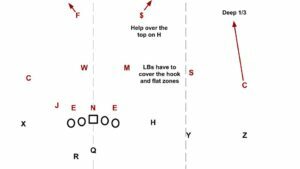 The trick is that your jack LB has to play underneath and the corner is now your deep defender. Oklahoma didn’t utilize this set terribly often last year for the obvious reason that it dropped their only good pass-rusher (Obo) into the flat. Instead they tended to lean on coverages that left that cornerback on an island. 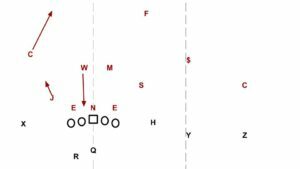 This is set up to look like cover 2 but it’s actually a single-high fire zone with the free safety and then will LB Lehman handling the boundary receiver while Strait blitzes. Of course, Strait comes a tad late almost like a spy and is able to shut down the Ell Roberson scramble. Strait was a good tackler and a savvy player, so having him near the action was immensely valuable for the 2003 Sooners. The potential downside of playing over 2 comes if your corner isn’t very physical or effective as a tackler. If he is good in that role it becomes a nasty option for denying the easy money on the boundary. Playing cover 2 on the boundary with physical, savvy defenders is a very conservative look but it can allow a team to get really aggressive because offenses often don’t really account for that CB in the run game and QBs can loose track of him when trying to throw their favorite passes to the short side of the field. Like every other good cover 2 corner in history, Strait got his share of INTs from sinking under the receiver in coverage and undercutting a pass. The days of Oklahoma being able to play ostensibly conservative schemes with fast and aggressive players that could attack opposing tendencies are over and done. Their 2003 defense would not look out of place trying to combat today’s spread offenses, in fact it looks even better suited to that task than any of their defenses since Mike Stoops came back.